If the effective length of a vertical member surpasses 3 times its minimum lateral dimension bearing compressive loads, it is known as a column. The loads from the beams or slabs are transmitted to the footings or foundations via columns. Struts are inclined or horizontal members and usually short in length with regard to the columns. It bears axial compressive load. The columns mainly bear axial Loads and hence, they are designed for compression. Other loads from snow, wind or other horizontal forces lead to bending in the columns. Then, columns should be designed for Axial Load and Bending. Circular column: These specifically designed columns are frequently applied in piling and elevation of the buildings. In elevation, this type of column is utilized to get rid of edges. They are also suitable for sit out areas, auditoriums or fire assembly zones. The circular columns can also be used as pillars of Bridges. Square or Rectangular Column: They are very effective in developing the buildings. These types of column are arranged when the shape of the room comes with a square or rectangular shape. The process is very simple to erect and cast rectangular or square columns as compared to circular ones due to simplicity of working with the shuttering and support it from collapsing caused by pressure whereas the concrete remains still in flowable form. The square and rectangular ones are superior and the expenses for casting is less. L - Type Column: They are normally utilized in the corners of the boundary wall and contain similar features of a rectangular or square column. These types of columns are seldom used. T - Type Column: This type of column is utilized on the basis of the design needs and in the erection of bridges, etc. It contains similar features regarding a rectangular or square column. V- Type Column: This V shaped column is normally applied when the shape of the room remains in trapezoidal. Sufficient quantities of concrete are required for constructing this column with regard to the other columns. Hexagon Column: Hexagon columns are usually reformed columns. It contains six sides and it offers good illustrative view normally applied in elevation. The purpose of this column is to provide a good appearance to the column. It is mostly found in open verandahs, Auditoriums, Cinema halls etc. Arch type columns: These type of columns are effective when the room contains a arch type shape. It substitutes the square or rectangular or circular type of column in a building. It is seldom used since the casting process is very complicated. 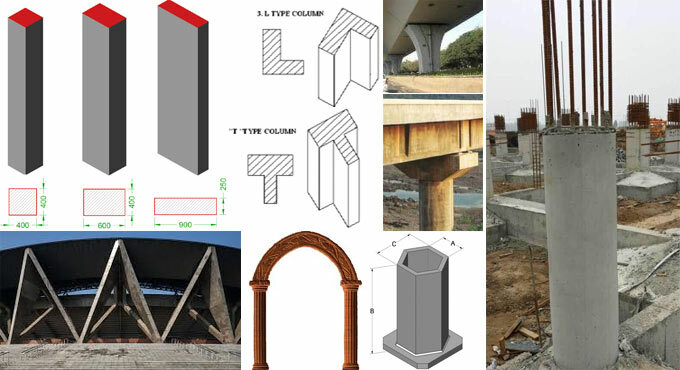 Y – Type Column: This type of column is normally applied in building the bridges, flyovers, etc. Y type Column with Arch: It has similarity with Y-type column but it contains curved edges or sides. They are normally arranged underneath the bridges and flyovers where there occur congestion of erecting more columns to resist heavy loads on top.